Discussion in 'The Watercooler' started by MojaveDesertPghFan, Feb 3, 2016. My wife and I just started watching season 4 a couple of weeks ago. We're up to the 7th episode so far. Man, this show has been great from the start, and it just keeps getting better. I loved Saul's beatdown on the punks who mugged him. And yea, it's always had the Breaking Bad vibe, but it's really starting to head that way more. I'm loving it. Poor Jimmy. Starting to see how him and Kim come to an end. I wonder if she'll reemerge at the conclusion of the show. This is all Jimmy reminiscing after all on how his life went into the ****ter. Then again he is a fugitive so what kind of life would they have together. Maybe she represents him in court, that would be a kicker. Goodbye Jimmy McGill, hello Saul Goodman or as Jimmy says to Kim leaving the Bar Association Appeals mtg: "It's all good man" or if you say it fast "It's Saul Goodman". Now we know where the name came from and when he officially did it (he used it previously when he was selling mobile phones out of his trunk). He didn't want the stigma of Chuck's legacy with the McGill last name as he pursued his resurrected law career. Damn, now we have to wait a full year for Season 5. I don't know - Kim got a buzz with the fake character building scam for Jimmy's cohort who whacked the cop when she told Jimmy, "Let's do it again". Fast-forward to the next few segments and it looks like they're doing better although she's shocked when he tells her he's changing his name at the season's end. That's what happens when Gus Fring owns your huevos. Only question (raised again) is will Gus let all the other workers go back to where they came from? I think Mike's dirty work is just beginning. I don't think Gus was going to let any of them leave town in an upright position from the beginning, including any newbies who are called in to finish up the construction job. No loose ends in Gus Fring's world. And you know that this Lilo character's days are numbered as he gets closer to the big secret. So many story lines in this series. I'm disappointed they had Mike kill him. He was never the muscle in BB, just the covert guy that can handle himself. I liked the fact that Mike skirted the line of working for Gus but not dirtying his hands by killing innocents. That German guy was a husband and father of two girls. Mike went full blown bad guy there. She gets a buzz from it but its just a game to her but Jimmy is becoming that for real and she see's that at the end of the last episode. I actually thought Jimmy was having a sincere moment, he got me too! I think that advice he gave to the girl who was rejected is going to come back to haunt him, bet she does something stupid and gets herself killed or thrown in jail. That wasn't a very good pep talk he gave her! If I had a nickel for every term in the English language that's been hi-jacked....I'd probably have a few dollars by now. I can remember my Dad whacking me on the noggin a few times and I'm still here to talk about it. You are right about Kim Blast, she's doing these crazy things for sh**ts and giggles and for Jimmy/Saul it's a metamorphosis although deep rooted and a long time coming. I still think Kim re-wrote the letter and signed Chuck's name to it and maybe at some point when she's really peeved at him, she tell him for spite. 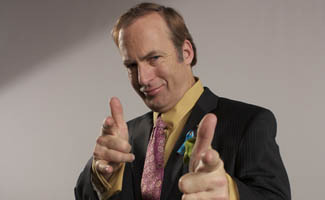 Looks like next season will be the last which makes sense now that Jimmy has gone full Saul Goodman. Not much more story to tell. They'll need to wrap up Jimmy and Kims split, since she isn't in BB, thats really the only logical avenue they can pursue. But is it because she doesn't approve of who he becomes or because something happens to her? I always had a foreboding feeling something bad happens with her involvement in scamming people for kicks. I still remember the first guy they took, the "big shot" investment guy. I felt like he would make them pay if he ever ran into them again. Nachos, poor Nachos, he'll be killed off for sure. No turning back for Mike, killed that German guy. Wonder how his crew will react to that, I'm sure they would put two and two together. I think Gus will see to it that they never get back home. One more season for Jessie to make an appearance, wonder if he will. They should actually incorporate White and Jesse into it, at the very end of the season, they can show how they get on Gus' radar. That would be a good way to wrap it up. Is it confirmed? Wouldn't surprise me. The actors aren't getting any younger. I have a feeling that Kim is going to be collateral damage somehow. I'll be bummed when it ends. I really like Gilligan's style of storytelling. No, not confirmed. Vince Gilligan has said that he'd like to make it the same length as Breaking Bad which was 5 seasons. Some speculation is that it will be 20 episodes instead of 10 though. Don't know about that, that seems like a lot. Maybe 12-15 episodes. The whole point of Better Call Saul was his transition from Jimmy to Saul. They just competed that in this season finale, so how much could there really be left to tell. I think it will wrap up next season. Let's not forget future Jimmy/Saul baking Cinnabons who could easily slip back or morph into another character. That way he wouldn't have to look like he's 10 years younger. Depends on whether Bob O wants to continue on in a post BCS/BB world. Just finished episode 10 last night with my wife. Man, this show is just getting better and better as it goes. I'm to the point that I can honestly say I'm enjoying it every bit as much as BB, and I don't want it to end. But I know it has to at some point because of the premise, but man is it good. I'd love it if when they wrap up the stuff that happens up until BB, they go ahead and have another couple of seasons in the present with Jimmy in hiding. Is everybody ready for the Breaking Bad movie? I just saw an ad for that the other day. I'm pretty excited by the idea of this. Wow! Tell me more. Same cast? Same story line? Prequel? Sequel? Just the opposite of what the Fargo people did and that actually turned out pretty good. Maybe the best TV to big screen adaptation IMHO, was the Fugitive with Harrison Ford. Not including the Superman, Batman, Spiderman, Green Hornet genre since they all started out as Comic Books. Don't have any details but, Cranston confirmed that it's happening. He said he's not sure if Walter will be in it! Coming from Vince Gilligan, it'll be great anyway! Same here! It took me a long time to get around to it (so I've avoided this thread), but I finally finished season 4. I love this show. Have they said if season 5 is the final season? Seems like it will be. Its my favorite show on TV right now, it's amazing. Vince Gilligan has hinted that he likes the idea of keeping BBS to the same amount of seasons as Breaking Bad, which was 5 seasons and really doesn't seem like they wouldn't be able to wrap up Jimmys story in season 5. They are almost at the point where BB began.